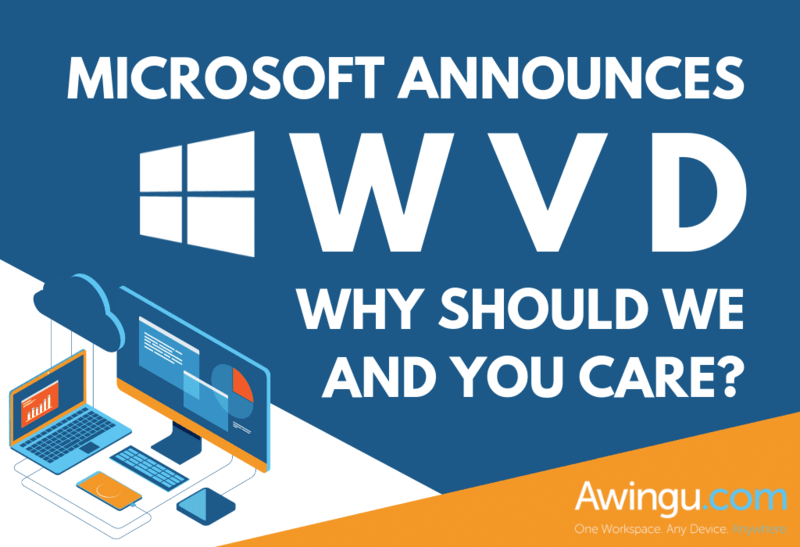 Microsoft announces Windows Virtual Desktop (WVD): why care? On March 21st, 2019, Microsoft announced the public beta release of ‘WVD’ – “Windows Virtual Desktop” in full. It’s kind of a big thing for Microsoft, and perhaps for the entire industry. In this blog post, we’ll give insight into what WVD is, and what it isn’t. Furthermore, let’s take a look at how it compares to Awingu… and how Awingu can “adapt and improve” WVD. Let’s start with the beginning. What is WVD? Making it very simple (cutting a few corners in the process): WVD offers multi-session Windows 10 VDI on Azure, where the RDP components of the infrastructure are run as PaaS service and are managed by Microsoft. WVD can also be used to access RDS-based applications and desktops, but for the sake of simplicity, this post will focus on the VDI part (as WVD doesn’t bring a lot of benefits for RDS-based environments). For the sake of semantics. When we refer to ‘RDS’ we mean a connection to a Windows Server OS. When we write VDI, we mean a connection to Windows Client OS. For the sake of this post, Windows 10 multi-session is seen as an evolution of the ‘VDI’ scenario. We understand this perspective can be confusing, but we feel this is the best way of positioning WVD in the bigger picture. The ‘multi-session Windows 10’ bit is actually interesting as it can decrease the infrastructure and licensing cost for VDI (i.e. the connection to the Windows 10 client OS). This multi-session version will, however, only be available on Azure. It is still to be confirmed if this will only be accessible as a part of WVD, or if you would be able to consume multi-session Windows 10 without the WVD layer on top. To be clear: it will not be available on other public clouds, nor in private clouds. In those instances, you will require using single session Windows 10 for VDI, or Windows Server-based deployments (i.e. RemoteDesktop and RemoteApp using RDS). Users can access their Windows 10 instances by installing the latest version of the RDP client on their device, or by using RDWeb. This client will use WVD’s ‘reverse connect technology’. Older versions of RDP clients will not work. In terms of licensing, Microsoft has announced WVD access and multi-session Windows 10 will be part of Windows 10 Enterprise licenses (e.g. Windows 10 Enterprise E3/E5 and Microsoft 365 E3/E5). The hosting of WVD services on Azure is ‘part of the price’. However, the consumption of your VDI VM’s is not: you will still pay for those. Note: if you want traditional RDS access (i.e. remote access to Windows Server), then the RDS CAL will still apply, also in the WVD scenario. WVD is expected to go live in the US market first. If we need to guess, the Microsoft Inspire event in Las Vegas in July ’19 will be the chosen momentum for Microsoft. In a second phase later in Microsoft’s fiscal year we expect Europe and some other regions to be added. Where some things might still change between what we know today, and what will be launched, it seems clear that WVD is a “v1”. There is no back-end automation to optimize your Azure consumption, there is no automated FX Logix deployment, etc. Yet. We’re sure these will follow later in time, but they are not here yet. How does Awingu compare to WVD? Does not require a Windows 10 license; e.g. users can use an inexpensive Chromebook and connect to an RDS-based application. How will Awingu & WVD move forward? Awingu will embrace WVD by aggregating (multi-session Windows 10) desktops and applications that run behind it. As such, end users can have a single pane of glass with all their apps and desktops running behind it, independent of their location, device, cloud, etc. Awingu aggregation. Probably not all of your users will require hosted desktops on Azure. Some of your users might need to connect only to a selection of applications, some might not require a full Windows experience (e.g. Chromebook users), etc. With Awingu you create one unified experience in the front-end which makes life easier for the users, and those managing the users. Simplicity in user management. Today, adding a user in WVD still requires scripting in PowerShell. With Awingu “on top” the process of adding users and groups is very straightforward. Awingu session sharing. Easily share your hosted desktop with other users for collaboration purposes while having a full and easy audit trail of everything that happens within those sessions. Combining the two will unlock the best of both worlds for those businesses that wish to run and benefit from multi-session Windows 10 on Azure.